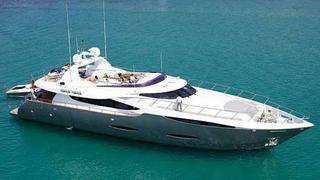 Hanneke Maljaars at Oceanstyle tells me of a €400,000 price reduction for Leight Notika’s 32.6m motor yacht Momentum. This Bill Dixon designed yacht, delivered in 2006, combines a stylish exterior with modern interior. There is spacious accommodation for nine guests in four cabins including a full beam master cabin on the main deck with split level en-suite. The latest maintenance history includes a complete re-varnish of all interior areas and a full exterior Awlgrip paint job. With an excellent charter history, this superyacht already has seven weeks booked for the coming season and is now asking €3.5 million.